JACKSON, Miss. 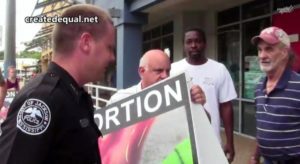 — Police in Mississippi watched idly this week as a business owner stole pro-life signs that were displayed on the public sidewalk during an awareness outreach, according to video footage from a Christian ministry. The Ohio-based group Created Equal, which travels the country to educate citizens on the reality of abortion, visited Jackson, Mississippi this week and set up a display outside of the state’s last remaining abortion facility, Jackson Women’s Health Organization. The display was part of the group’s Justice Ride tour, which is being conducted nationwide this summer. Created Equal set up signs both outside of the abortion facility and across the street, placing them on the public sidewalk and toward the view of traffic. However, soon after, Mike Peters, the owner of Fondren Corner, began confiscating the signs and moving them one by one to his basement. “He’s stealing our signs,” one of the members of Created Equal tells a nearby officer. “Are you going to allow someone to just walk away with our property?” another member asks a female officer minutes later. “I’m watching it,” she replies. 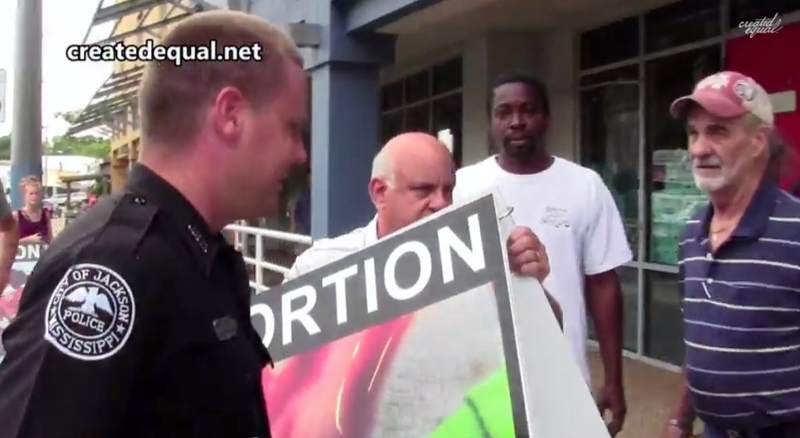 One video clip shows Peters confiscating a sign directly in front of a police officer, but without objection. Created Equal has now filed charges against Peters, but said it is concerned about the Jackson Police Department’s reputation of violating the First Amendment rights of Christians. As previously reported, numerous Christians have been arrested and charged while conducting peaceful outreach outside of Jackson Women’s Health Organization. Cal Zastrow, a missionary who often reaches out to pregnant mothers at the facility, was arrested twice last year—in one instance for allowing the sign he was holding to touch the ground, and in another instance for sitting on a stepladder on the sidewalk. A police officer also confiscated one of his signs as he stood on the public sidewalk. Former police officer Chet Gallagher was likewise arrested last year by Jackson police while preaching the gospel through a hand-held speaker. Zastrow had also been pepper sprayed in the face last year by the security guard for the abortion facility, and initially experienced difficulty filing a report against the perpetrator.